Christine over at Peak Oil Hausfrau wrote a brilliantly funny account of how, due to global warming, denizens of the underworld are planning on colonizing Earth. If you have even the remotest interest in global climate change, transition towns and peak oil, go check it out! Hell today announced a new Pilot Colonization Program to relocate demons, devils, incubi, succubi, and Damned Souls to the surface of the Earth, starting as early as 2012. Lucifer Jr., Senior Executive Vice-President of Hades, explained the rationale behind the new program: "From our perspective, warming Earth temperatures offers an infernally perfect solution for the overcrowding we've been experiencing in Hell for the last 66 years. 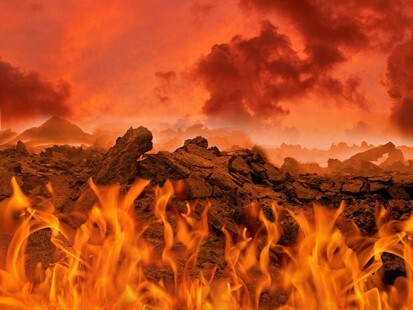 As the planet heats up, Earth will present a terrific opportunity for Hell's growth and expansion." However, legal experts say that Hell's colonization of land owned by various Satanic holding companies is all perfectly legal. U.S. Supreme Court Justice Antonin Scalia, an avid property-rights advocate, observed, "Some people say that Demons belong in Hell. I tend to agree, but Satan has purchased this real estate through legitimate and proper channels. What would happen if we tried to just nullify all the contracts that we didn't like? Chaos, that's what!" Thanks, Christine, for brightening, er, darkening my day! I got to meet her. :) She is another Okie.